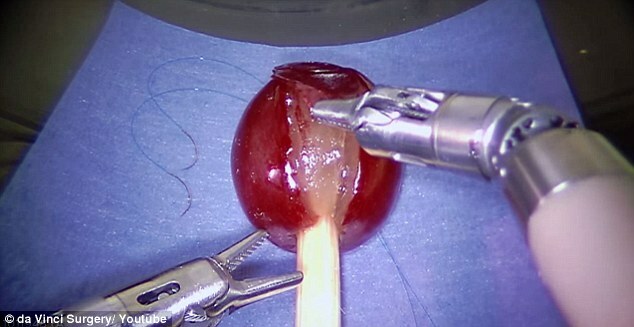 A small robotic device used by doctors for less-invasive surgery was able to reattach part of a grape skin in a painstakingly delicate operation. 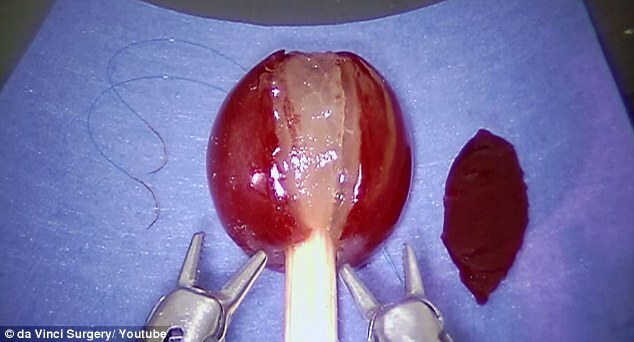 The Da Vinci surgery system, which has recently begun to assist surgeons in hysterectomies and gall bladder removals, was filmed as it sutured the tiny berry back together. The robot, which uses miniature instruments is remotely operated by a surgeon, performs complicated tasks such as tying knots and perfectly placing the skin on the grape during the stitching process. A video of the procedure shows the remarkable precision, though it is not until the end that viewers see that all of the action is taking place inside a small bottle. Grape skins are only fractions of a centimeter thick. Surgeons use the device to be able to work effectively inside patients' bodies using keyhole surgery rather than creating bigger incisions that leave scars. The Da Vinci robot, where the surgeon looks at a 3D video of the area being operated on at a large console, is able to complete procedures where the surgical hole is less than two centimeters.